Atypically for an early summer weekend, the weekend’s slate doesn’t consist solely of a single mega-blockbuster hitting theates, based on some sort of pop-culture and throwing up a figure in the three-digit millions. This weekend’s three releases combined might reach that, but none on their own promise box office fireworks. The obvious leader of these three films is Robin Hood, approximately the bajillionth time this subject matter has been turned into some kind of entertainment property. 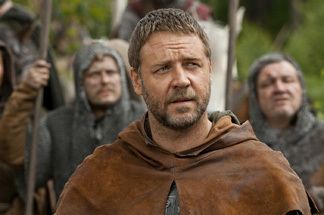 Directed by Ridley Scott and starring Russell Crowe, it purports to tell the origin of the Robin Hood legend (with a 46-year-old lead!) and his battles against the tyranny of King John and the Sheriff of Nottingham. This version of the story focuses, in Scottian fashion, on the battle aspects of the legend, throwing up set pieces of hand-to-hand medieval combat, and judging from trailers, a reversal of the Normandy landing scenes from Saving Private Ryan, not to mention some historically dodgy ideas about political theory and one of the more tragically misdelivered lines to ever appear in a commercial (I declare that actor to be an OUTLAAAAW!). This was a production that was famously troubled, going through several recasting sessions, most notably dumping Sienna Miller as Maid Marion for Cate Blanchett (a trade up in many departments anyway) because the former actress was making their lead look too old in comparison (still a problem, guys). It also had the indignity of its budget being posted with its breakdowns, revealing that the film cost a frankly ridiculous sum of $237 million to make and promote. This is before we get into the fact that the Kevin Costner version of Robin Hood still sits fondly in people’s memories even nearly 20 years later (probably a length of time that would surprise people). Jokes about Costner’s non-accent aside, it’s still a definitive telling of the tale, and doesn’t seem particularly due for a remake. It’s also interesting that they picked a lead with almost as poor of a reputation as Costner eventually earned – Crowe’s proved to be a boor on multiple occasions, and hasn’t had a film live up to financial expectations for about nine years when he was the sole lead. Still, it’s a big budget production of Robin Hood that promises a lot of action and that’ll always have a baseline of support. It really lacks that certain oomph that would push it over the top as a major summer film, and will really depend on foreign box office to turn a profit. This weekend, look for around $48 million.